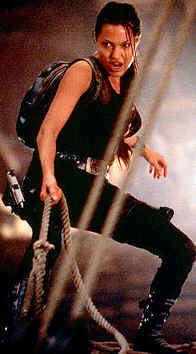 As Tomb Raider opens, we find Lara Croft (Angelina Jolie, of course) hanging suspended from a rope. Not even her intricately woven braid stirs. Then, in what will quickly become a matter of course for this film, she runs-jumps-flips-climbs her way through an ancient looking cave of faux ruins and blows the holy hell out of the ultra-advanced robot assassin that serves as her “sparing partner.” All in a flash-bang opening action sequence designed to drive home a singular point: that Lara Croft is a Badass. Needless to say, the sequence accomplishes its goal…so, I asked myself, what the hell is the rest of the movie supposed to do? Spiral ever downward, apparently. But we’re getting ahead of ourselves.